Making plans for 2015? 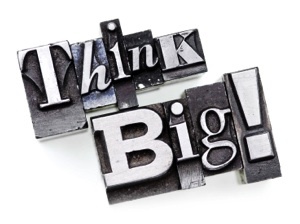 Don't forget to think big! As one year finishes and another begins, this is an ideal time to do some thinking about what you would like to achieve in the year to come. One of the most effective ways to do this is to take yourself out of the present and transport yourself into the future. Rather than think about what you would like to happen in the coming year, transport yourself to the end of next year and imagine that everything you wanted to achieve has already happened. What will your life look like in a year’s time? What are you doing? Where are you? Who are you with? What have you achieved? Make this as detailed and vivid as you can. And THINK BIG! Don’t limit yourself. The key is to write your vision in the PRESENT TENSE – as if it has already happened. You can use narrative, lists, bullet points or pictures to describe what your life will look like. Or cut out pictures, phrases and captions from magazines. Have fun, get creative and again – think big. It’s quite miraculous how powerful this exercise can be. Over and over again I’ve been thrilled to witness a client’s delight and amazement when they revisit their one-year vision and realise that they’ve achieved everything they had envisioned – and much more! So if you want the next year to be a raving success, my tip for this week is to get started on your One Year Vision. Have fun with it – you could even get the family involved, and do a ‘Family Vision’ together. If you want to take this further, once your vision is finished, you can divide the year into smaller segments. In other words, to achieve your one-year vision, what would you need to have done in 6 months? 3 months? The next month? Keep working on it and seek support if you need it. Wishing you a happy and peaceful 2015 and all good things in the year to come!